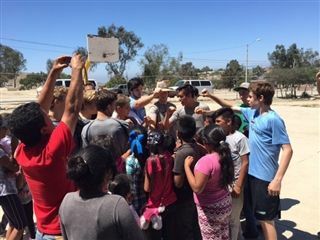 In late July, members of the Pacific Ridge Boys Varsity Basketball Team traveled to Tijuana to run a 3-day youth basketball camp. Working in collaboration with a camp being managed by educational non-profit Responsibility, the Firebirds taught basketball skills to more than 30 eager boys and girls in low-income Colonia Fausto Gonzelez, a community that was originally established by workers of Tijuana's largest municipal dump. The players led campers in basketball basics, drills, games, and cheers. The Firebirds also used the trip as an opportunity to engage in friendly international competition against local teams, practice their Spanish, and enjoy cultural activities.